You can make your tires last longer with regular tire rotation and wheel balancing. Let’s start with tire rotation. In normal driving around, your front tires wear more on the shoulders because they handle much of the cornering forces in turns. 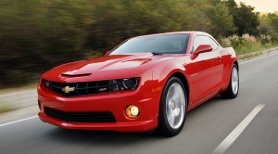 Front-wheel drive vehicles have even more force on the front tires. For most vehicles, tires are rotated front to back. Some manufacturers recommend a cross rotational pattern that includes the spare tire, and some high-performance vehicles have different size tires on the front and rear and may even have uni-directional tires that can only be on the left or the right side of the vehicle. Your service adviser at Express Car Care can help you sort that out and will perform the right tire rotation for your vehicle. Balancing adds weights to the wheel to balance it out. We are talking about very small weight differences. Variations in the tire and wheel manufacturing can cause a slight imbalance. the valve stem, and now the tire pressure monitoring sensors in the tire, also play into the equation. If a front wheel is out of balance you’ll feel the vibration through the steering wheel. When it’s a rear tire, you’ll feel the vibration through your seat. If you’re getting bad vibrations from your vehicle, bring it in to see if it’s a balance issue or something else. You should balance your wheels whenever you get a new tire or remount a tire, as when it’s been removed for a flat tire repair. You can make the tires on your vehicle last longer with regular tire rotation and wheel balancing. Let’s start with tire rotation. In normal driving around Denver, your front tires wear more on the shoulders because they handle much of the cornering forces in turns. Front-wheel drive vehicles have even more force on the front tires. We rotate the tires so that all of the tires do some duty on the front end as well as getting a little break on the back end. That way, all four tires wear more evenly over their life and should last longer. For most vehicles, tires are rotated front to back. Some manufacturers recommend a cross rotational pattern that includes the spare tire. And some high-performance vehicles have different size tires on the front and rear and may even have uni-directional tires that can only be on the left or the right side of the vehicle. Your service adviser at Express Car Care can help you sort that out and will perform the right tire rotation for your vehicle. Let’s move on to wheel balancing. That’s when there are heavy spots on the tire and wheel that cause it to wobble. Balancing adds weights to the wheel to balance it out. Now, we are talking about very small weight differences. Variations in the tire and wheel manufacture can cause a slight imbalance. 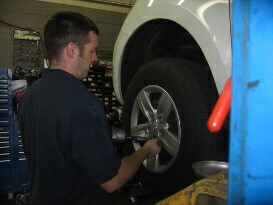 The valve stem, and now the tire pressure monitoring sensors in the tire, also play into the equation. Even small differences can cause annoying vibrations at speed: the wheel is essentially bouncing a bit as it goes down the road. For example, at freeway speeds, an out of balance wheel can be slamming into the road 14 times a second. That’s annoying and can also cause your tires to wear out more quickly. If a front wheel’s out of balance you’ll feel the vibration through the steering wheel. When it’s a rear tire, you’ll feel the vibration through your seat. If you’re getting bad vibes from your vehicle, bring it in to see if it’s a balance issue or something else. You should balance your wheels whenever you get a new tire or remount a tire, like when it has been removed for a flat tire repair.